Whereas artifacts, animals and all sorts of otherworldly creatures have long occupied the attention of anthropologists, recent encounters with science and technology studies have stimulated a novel interest in ecological thinking. Part of the impetus for this research comes from a shared critical stance towards the anthropocentric bias of social research. Another important issue central to these debates has been a growing emphasis on innovation at the ethnographic level. 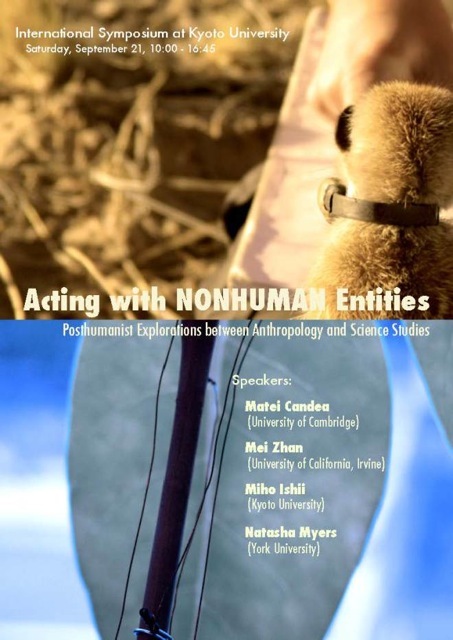 Posthumanist approaches call for a closer attention to nonhuman entities by exploring their role in what constitutes the senses, persons, worlds, etc. This conference will reflect on these conceptual and methodological currents in anthropology and beyond with the participation of scholars from diverse backgrounds and fields of study. Some of the key concerns and question we shall focus on are: What disciplinary boundaries have to be crossed or permeated to reveal otherwise unattended links between human and nonhuman ways of acting in the world? What are the distinguishing features of these analytic experimentations when compared to earlier work in ecological and cultural anthropology? How do the variety of posthumanist trends, from actor-network theory to multispecies ethnography and ontological anthropology, differ from and relate to each other? We hope to address these questions by both discussing new theoretical challenges and presenting diverse ethnographic cases relevant to the ongoing transformations of the world—a world, which is populated with humans and animate non-humans alongside techniques, and anthropologists who try to understand them.